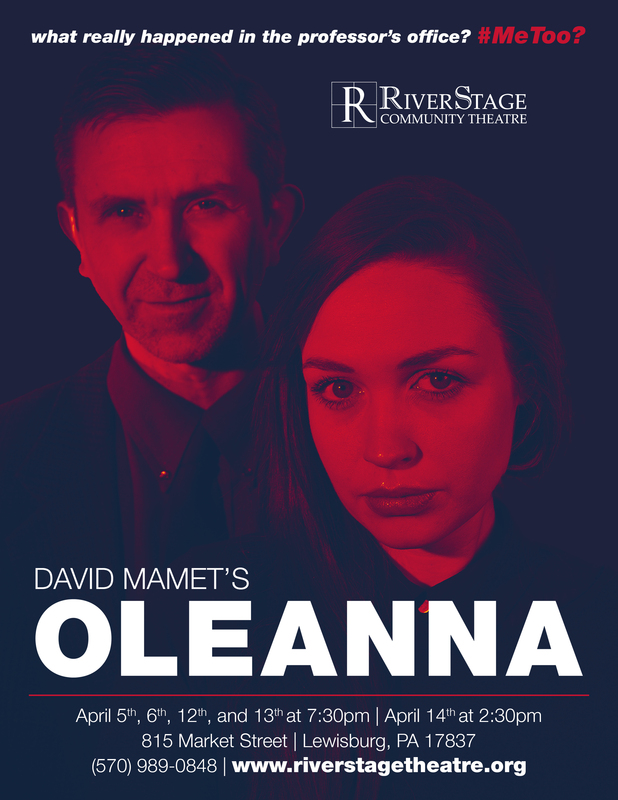 LEWISBURG –RiverStage Community Theatre will present the gripping drama Oleanna by David Mamet, with performances held over two weekends, Fridays and Saturdays April 5th, 6th, 12th and 13th at 7:30pm and one Sunday performance on April 14th at 2:30pm. Performances are at Greenspace Center, 815 Market Street in Lewisburg. All seating is general admission, tickets are $15 for adults and $7 for students (high school and up) with group discounts available and can be purchased at the door, by calling 570.989.0848 or by clicking here. Because of mature themes and strong language, the show is not recommended for young children. 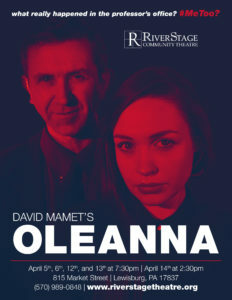 Oleanna by David Mamet is a fiery and fierce story, seemingly ripped from headlines of the modern era of the #MeToo movement. Over the course of three tutoring sessions, a young female college student, Carol, and her professor, John, view each other’s behavior from two drastically different perspectives, and the concept of “he said, she said” reaches explosive new heights in a story of miscommunication, manipulation, gender politics, privilege and power. Every word and nuance of the characters’ sessions together is picked apart and twisted around, letting audience members decide for themselves who is right and wrong in this tense, fascinating, breathtaking tale of men and women, professors and students, with an explosive ending that has left audiences arguing for decades. “This 1992 play has many layers of meaning and is as much about the American Dream and the condition of U.S. education as it is about sexual harassment,” says director Peter Wiley. “David Mamet is one of America’s leading and most controversial playwrights and screenwriters. He was partly inspired to write Oleanna during the confirmation hearings of Justice Clarence Thomas who was accused of sexual harassment by Anita Hill, and that timely piece has become eerily timely again today. I am fortunate to have two very strong local actors, Samantha Roberts and Jove Graham, giving life to these two powerful characters, and it will be an electrifying experience to see on the stage.” Critics have described the show as, “tough,” “unflinching,” and “one of the most stimulating experiences you can have in a theatre.” A 1994 film version starred William H. Macy and Debra Eisenstadt. “A seething investigation of political correctness in a time when the nation’s morality has been tested by increased incidents of sexual harassment. OLEANNA is likely to provoke more arguments than any play you’ll see.” —NY Times.